CAP Services’ Fran Beilke receives WCASA Voices of Courage Award – CAP Services Inc.
At right, Fran Beilke, Waupaca, poses with the fellow Wisconsin Coalition Against Sexual Assault (WCASA) Voices of Courage awardees in the Victim/Survivor Advocacy category during WCASA’s annual awards luncheon in the Wisconsin Dells June 8. 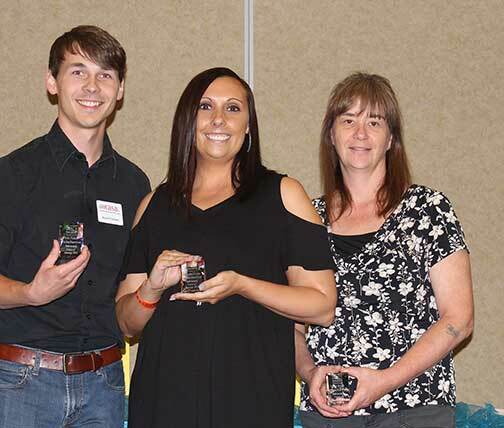 Wisconsin Coalition Against Sexual Assault (WCASA) recognized CAP Services’ Fran Beilke with a Voices of Courage Award in the Victim/Survivor Advocacy category during WCASA’s annual awards luncheon in the Wisconsin Dells June 8. “I feel both honored and humbled by this recognition, and am thankful to be part of such an incredible team of people,” said Beilke, who works as a Sexual Assault Victim Advocate in CAP’s Waupaca office. Sexual violence is pervasive in Wisconsin. The most recent National Intimate Partner and Sexual Violence Survey found that 35.5% of women and 18.8% of men in Wisconsin experience contact sexual violence during their lives. “WCASA’s Voices of Courage Awards highlight leaders across Wisconsin who have demonstrated extraordinary commitment to ending sexual violence,” said Pennie Meyers, WCASA executive director. The Wisconsin Coalition Against Sexual Assault (WCASA, www.wcasa.org) is a membership agency comprised of organizations and individuals working to end sexual violence in Wisconsin. Among these are the 56 sexual assault service provider agencies throughout the state that offer support, advocacy and information to survivors of sexual assault and their families.